It is enclosed in a low-pressure environment so it gives off NO pollutants. Nothing escapes into the environment except clean air, energy and a stream of new products. The precious resources that go into all the “stuff” that we throw away are transformed into new streams of environmentally clean, recyclable, efficient products. It’s entirely environmentally balanced. Organized in 2001, the Academy affirms that transforming humanity’s waste by-products into useful products is a vital link to a sustainable future for the human species. To meet this goal requires a global alliance with academies, governments and businesses to research, develop and implement the latest information and new technologies that help establish sustainable communities that are in balance with the biosphere. The PR Park includes three types of retrieval: manual (paper, plastics, metals, etc. ), gas and liquid (oils, chemicals, etc.) and remaining substances that are processed by the Superplasmic Field Generator© where they are heated to sufficient temperatures to disassemble the structure of the molecules. Approximately forty percent (40%) of the energy released is used to run the operation and the remaining sixty percent (60%) excess energy is converted to electricity and made available to the larger community. A team of Tenant Companies processes each substance in the input stream. Each Tenant Company is an expert on retrieval of the specific products involved. A Site Company that coordinates and controls the overall operation of the Retrieval Process correlates the retrieval process. 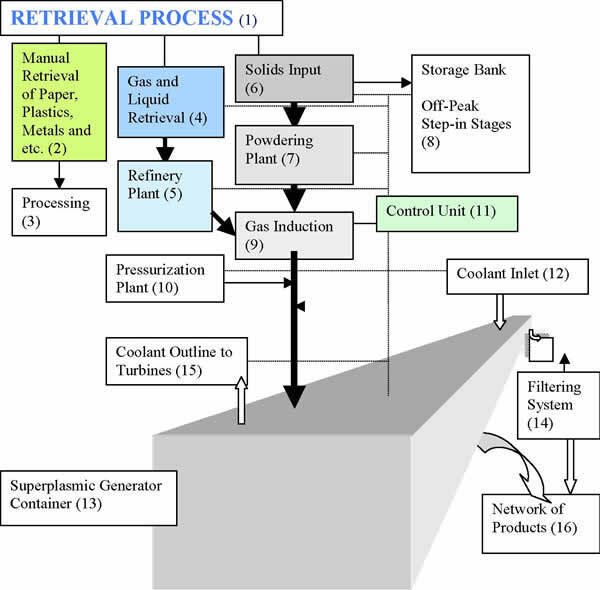 As you can see from Diagram 1, below, three retrieval processes are used in the Remediation Park: manual, gas/liquids, and solids. A primary goal of a PR Park is to retrieve one hundred percent (100%) of resources that are essential to assure the preservation of the environment and resources of the planet for future generations. The PR Park establishes sustainability because it not only stops the pollution but it also generates a network of energy and industry on site making it possible to establish a self-sustaining community. We humans are, as a species, taking the next step in our evolution. We are joining together to make every effort to limit the rise in global temperatures so it stays beneath the 2°C that is essential to insure the survival of our species. We have the technology and the resources. We can put an end to industrial and community pollution and stop the rampant waste of the limited resources of our planet. Our first step is to establish an effective retrieval and recycling process within each of our communities. Here are more details of its operation (#s refer to Diagram 1). Manual Retrieval requires people to separate out, by hand or machine, the paper, plastics, rubber, metals and other visible retrievable substances that can be recycled into use in our society. According to reports, about twenty percent (20%) of visible wastes are recycled in America via manual/mechanical retrieval processes. The rest are usually burned or buried in landfills. This practice is considered a crime against future generations. According to current estimates, if we recycled the paper that is currently in use we would never have to cut down another tree. Paper that cannot be used in recycling for one reason or another can be used in other products (such as paper cement, etc.). Recycled plastic, a by-product of oil, will save millions of gallons of oil a year. Recycled rubber can produce hundreds of products (as in combination with sawdust and made into Rumber – rubber lumber – that is extremely resistant to corrosion and used near the ocean in boats and decks, etc.). Processing junk cars can produce an ongoing stream of steel, copper, aluminum and other products that can be used to create new (electric) cars that are independent for oil and gas and pollution free. Numerous products can be made (see Network section for more details). The methane, carbon dioxide and other gases currently being emitted by local sewage treatment plants, city dumps and landfills, will be collected and transformed by the Remediation Park which integrates all gas-generating wastes and liquids into an enclosed low-pressure treatment process that does not allow leakage into the outside environment. Air within the facility is slowly pumped into the treatment process where impurities are removed. Liquids, such as sewage and toxic containers are processed directly into the system. (See the Network section for more details). Part of the heat from the Superplasmic Field Generator is used to operate a refinery for the oils, gases and other substances that have been fed into the Remediation Park. The refinery produces an ongoing supply of combustion-engine fuels and other uses. Any remaining unused substances from the refinery are reprocessed through the remediation system. Theoretically, everything is retrievable. 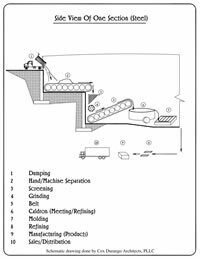 Conveyers to an ongoing retrieval process carry any solids, not retrieved by hand. Metals that respond to magnetics are picked up and dumped into the grinder and exposed to increased temperatures, refined and turned into useful products. Each metal melts at a different temperature so each is separated (using standard separation processes) and then processed onsite into various grades and molded into various products for market (see Network for more details). Each chemical component is gasified and centrifuged (in the “Bowel”) where each atomic weight is filtered off. Thus every element can be used as desired (see Network for details). The Remediation Park’s intake of waste materials will vary according to peak hours where peak input may not be able to be processed. The Storage Bank allows overflow to be stored until capacity opens to manage the materials. Since the generator has flexible input capabilities, it is unlikely that the Storage Bank will see much use but wisdom requires it be available as an option. As temperatures rise and materials are processed, everything left over, turns into a gas. The molecules of the gas are retrievable and remaining pollutants will be inducted into the Superplasmic Field Generator’s processing chamber. In order to control the rate of induction into the Generator Processing Chamber, it is necessary to have a pressurization plant. 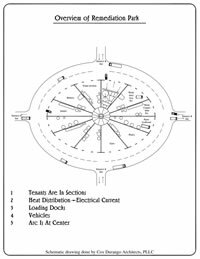 The Control Center assures that the rate of induction does not exceed the ability of the Generator Processing Chamber. Coordination of each aspect of the remediation process is managed through a Central Control Unit where a computer-integrated system insures every aspect of the process remains at maximum efficiency and effectiveness at all times. The average temperature of the Generator Processing Chamber can reach heights capable of dismantling the molecular structure of the waste material molecules. As the materials are processed they move closer to the generator arc and the temperature rises. Valuable gases are retrieved on a molecular basis by centrifuge according to their atomic weight. The coolant is dampered when it passes through various remediation processes. Water, for example, turns to steam that converts the remaining heat into electricity to run the Remediation Park and the sustainable community. The computer-controlled coolant flow dampers the temperature and cycles the coolant back into the generator to pick up more heat. The coolant flow is precisely controlled and completely safe. Nothing goes directly into the field generator. Materials pass by the generator at the maximum temperature for its required transformation. It’s all about temperature. As steel, for example, reaches the temperature of 2,000 degrees, it melts and is processed off into a Bessemer converter. As copper melts, it is put through a froth flotation device that allows purification of the copper. The Processing Chamber serves as the conduit through which each substance is separated out and placed into its most efficient purification process. All remaining unwanted substances are processed through to achieve temperatures that disassemble their molecular structures, releasing the energy that is stored therein. The heat generated produces enough energy to operate the process plus an additional sixty percent (60%) becomes available to the outside community. The community has its own local supply of power. After passing through the Processing Chamber the only remaining substance is a pure carbon ash that is collected on a series of electronic grab-grids. This ash has many industrial uses (see Network for more details). The result is a zero carbon footprint. No pollution goes into the environment. Heat produced from the generator and the Processing Chamber is carried by coolant through a series of chambers until it ends up in the electric generating turbines. The electricity is distributed through various applications in the Retrieval Processes. The remaining electricity is made available to the public grid. Depending upon the content of the Input Stream going into the Phoenix Remediation Park, a stream of products come out. Old steel becomes new steel. Old copper, aluminum, gold, silver and other precious minerals are retrieved along with everything from fabrics to oils. Each product provides a broader base for a sustainable community. The steel becomes available for multiple uses. Each precious resource can be cycled back into the society. Garbage is, in reality, a treasure chest for future generations. Pollutants, emissions and toxic wastes of all kinds provide a new economic opportunity for the entire community. In summary, the Phoenix Remediation Park is an integral part of an affordable, sustainable community because it is able to process each substance that enters the system in such a way that the minerals and other substances that are of value now or to future generations are recovered. Those elements remaining are processed at high temperatures until their molecular structure disassociates into energy and carbon ash. The ash is collected on an electric grid and used in industry to make new products. There are zero emissions into the environment. The retrieval process uses about forty percent (40%) of the energy it generates and the remaining energy can be made available to the larger community. The heart of the Phoenix Remediation Park and retrieval process is the superplasmic field generator. Using unique metal-infused ceramics enables direct current (DC) plasma of high-current capabilities to be formed and sustained by the high-voltage alternating current (AC) half-wave for AC component that is used to carry a high-current DC carrier of the same potential of the half-wave for AC component. This forms a superplasmic arc similar to a lightening bolt that is safely contained for continual use. The Superplasmic Field Generator© does not use conventional electrodes. A linear ion-array process is used to form a super-conductive cooling system with a combination of water and chemicals to carry the current, sustain the plasmic field, and redistribute the heat generated back into the retrieval process. Virtually any substance may be retrieved using this technology. Outside of the retrieval process, energy and pure carbon atoms are the main exhausts. The pure micro-carbon is collected on a series of electrically charged grab-grids and recycled into various industrial uses. The excess energy can be utilized in society and no pollution is released into the environment. The Superplasmic Generator is a hybrid superplasmic arc that combines different advanced technologies to produce the most effective retrieval process on the planet. Details are considered industrial secrets but all technologies being used have been tested and proven effective. The atomic disassociation of molecular structures at high temperatures has been demonstrated in different types of thermal reactors. 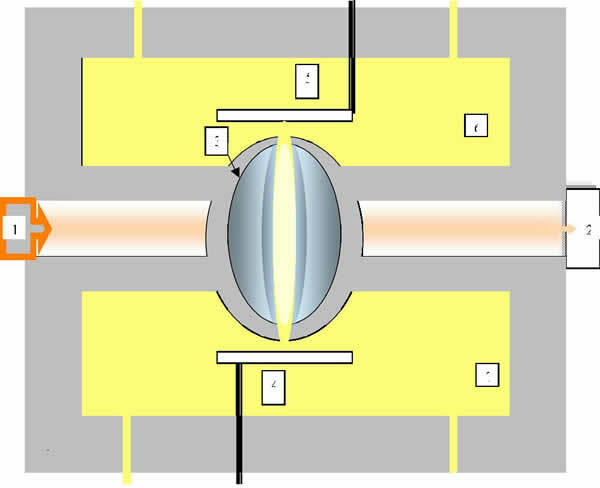 Until recently, all experimental thermal plasma reactors have used conventional opposing-electrode configurations. Although these reactors have demonstrated their effectiveness, their reliability has only allowed limited operational times because high temperatures decompose the electrodes. The generator must be shut down every few hours for 30 minutes to change the electrodes (see Support Data 2 for details). Other treatment processes, such as incineration, or dumping our wastes into landfills or oceans, has created such strong opposition from environmental interests that the public now is demanding more effective treatment. Increased pollution, caused by the exponential growth of the human population, has resulted in the dumping of millions of tons of pollution into the environment every day. We have created what scientists around the world now declare is the most serious situation ever faced by the human race. We must, as a race, deal with our emissions and pollution problems now in order to be sustainable. Remediation Parks, as presented here, are designed to effectively address this situation in a timely manner. It is vital to future generations that we transform the causes of climate change NOW! Mother Nature will not wait. One of the key ingredients to a successful, affordable, sustainable community is a Remediation Park with a Superplasmic Field Generator© that allows all precious resources to be retrieved. Each resource retrieved becomes part of the network of businesses that ensure the sustainability of the community. The Superplasmic Field Generator© is a relatively simple piece of equipment. It consists of a pair of chemically cooled tubular electrodes separated by a gap in which a discharge occurs creating a superplasmic field. Electric power (200KV) is supplied to the electrodes forming a DC current that is overlapped with an AC current (50KV), forming the superplasmic field. The high frequency/high voltage and the low-current half-wave form components capable of breaking down the resistance of the cell and the elements contained therein. Plus, a DC high-current component of the same potential can be varied to accurately control the temperatures within the plasmic field without causing any plasma quenching. Any increase of resistance seen within the cell, due to chemical changes or flow-rate variations, is overcome by the high-voltage component. 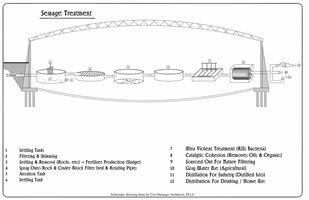 Final waste gases from the Retrieval Process (1) are brought into high temperature region near the plasmic field (3) causing their molecular structures to separate and generating heat that is absorbed by the coolant (6 and 7) and distributed back into the retrieval process. The remaining carbon ash is collected on an electronic Grab Grid (2) on the other side of the plasmic field. The alternating current (4) and the direct current (5) use the coolant as a conductor creating the superplasmic field in the interaction between them. (See Operational Synopsis for more operational details). Since the system has low voltage requirements that can be met by a number of DC storage means, the Superplasmic Field Generator© is portable. It can be situated in virtually any site, on land or sea. Chemical compositions may vary according to the wastes being fed into the generator plant. The synthesis of industrial toxic effluents and wastes – i.e., dioxins, P.C.B., cyanides, various acids, etc. – and their processes for degradation into usable or harmless elemental oxides, is a subject undergoing extensive research in various locations around the globe. Potential commercial users themselves must identify the specific chemistry of components involved in the treatment. While it may not be possible to predict what many of these combinations may be within the Superplasmic Field Generator© plant, or how they will respond to the Processing Chamber of the plant, it is predictable that every substance will effectively be retrieved or neutralized at discernable temperatures while remaining substances are transformed into energy and ash. In order to successfully commercially neutralize the main list of industrial toxic emissions and pollutant wastes, a stable, ultra-high temperature range, regulated by computer control, delivers an effective and efficient retrieval operation for both wet and dry feedstock. As the feedstock approaches the superplasmic field (without the risk of cold spots or flame-out) the process can effectively clear all chemical bonds in fractions of a second. The gas can then be separated according to atomic weight or electrolysis or other methods according to the substances involved (see Network below for details). Micro-analysis of particular wastes enables retrieval designers and/or operators to control temperature gradients, oxygen content, chemical combinations, time frames required to achieve clearance of elemental oxides, and enable them to build up a chemical “signature” or “profile” for each toxic element. The Processing Chamber is programmed for most effective and efficient treatment. The Superplasmic Field Generator© Plant effectively minimizes or eliminates the common problems associated with incineration processes. The coated ceramic processing chamber, plus the absence of solid electronic probes or electrodes, makes corrosion from acid-combustion gases improbable. High gas Velocity (50 fps) in a combustion zone is not critical in a sustainable plasmic field Processing Chamber. Thus the “burn” factor is eliminated. High particulate suspension or ash content of feed or residue is not relevant because there are no probes or electrodes to corrode. Since the superplasmic field is separate from the waste elements, the “burn” is not just a flame sustaining “pilot” device, so it is not susceptible to any “flame-out” condition. Available, simple electric storage devices make possible the continual use of the Superplasmic Field Generator© Plant. It is not dependent upon external electrical power, so rolling electronic blackouts, power shutdowns and limited off-peak electricity supplies, are irrelevant. The plant is a continual 24/7 self-sustainable operation. The coolant can be used to create electricity, power the Retrieval Process, heat the refineries that process products retrieved, and power the production of products (see Network below for details). The Superplasmic Field Generator© Plant is mobile and can be used in multiple locations and at various strengths and sizes. In order to preserve our precious resources, a retrieval process must accompany the plant. Network refers to the distribution/production system resulting from the Retrieval Process of the Superplasmic Field Generator© Plant within the Remediation Park. It’s an administrative bird’s-eye-view of the stream of products coming from the Remediation Park and the network of companies (herein Tenant Companies) that are experienced in retrieval of precious resources. The product stream provides the opportunity for thousands of new green jobs. While the actual coming out of the Network will depend upon the content of the waste streams coming into the Park, the opportunities are almost limitless. When, for example, an old junk car is dumped into the Remediation Park, the car goes through the retrieval process. The elements of the car are separated. The steel goes through the grinder, is melted down and transformed into new steel. The copper, aluminum, rubber, upholstery – everything – is processed. The Network shows how each element is then recovered and re-introduced back into society as new products or as raw materials for other uses. With some modifications, the old combustion-engine car becomes a new electric car – one that never has to be recharged (when people choose to build electric cars). The now-suffering automobile industry can be re-tooled to manufacture these cars of the future. In reality, the current chaos in the auto industry is a prelude to the transformation of our entire transportation/energy system. There is a way and, yes, we can do it! As municipal wastes are processed, the water is both recycled into gray water for plants and also into pure drinking water for everyone. Organics from sewage can be transformed into some of the best fertilizers on the market, as in the case of Kellogg’s fertilizers that are made from human sewage sludge (details available). The Superplasmic Field Generator© Plant insures all contaminants have been removed and all bacteria or other harmful life-forms are completely destroyed. Other substances in sewage will be identified and, when desired, separated from the sewage and transformed into useful products. Everything else will be disassembled into energy and carbon ash. The energy produced is used to run the Retrieval Process or sold into the community at large. The entire process is environmentally clean with a negative carbon footprint. It is profitable and self-sustaining and produces exponential growth of its own process when profits are turned back into developing more Remediation Parks. AN INITIAL INVESTMENT OF $320M YIELDS AN ESTIMATED RETURN OF MORE THAN $124M EACH YEAR. AND THESE FUNDS ARE TURNED BACK INTO CREATING MORE AND MORE REMEDIATION PARKS, THE NUMBER OF PARKS GROWS EXPONENTIALLY AND THE IMPACT OF HUMAN POLLUTION ON THE PLANET WILL BE BROUGHT UNDER CONTROL IN A RELATIVELY SHORT TIME. The resulting stream of new products includes carbon ash that is used for a variety of products. One of these products are the super capacitor battery that is as light as carbon ash and is reported to be 250 times more powerful than anything on the market. Such batteries will be used to power electric cars, boats, trucks, planes or trains for thousands of miles without a recharge. When combined with the new nano solar cells that are six times more efficient than any of its predecessors, driving into a gas station will be a thing of the past (see Supportive Data Attachments for more details). The Input Stream determines the content of the Network. What comes out depends upon what goes in to the Remediation Park. Carbon ash comes out no matter what goes in. In this presentation we discuss first the municipal waste-management system and then industrial emissions and pollutants along with medical wastes and nuclear wastes. Each is part of the Network that can be developed in association with the Remediation Park. The treatment of nuclear wastes remains one of the greatest environmental challenges of our era. Yucca Mountain, near Las Vegas, Nevada, was to be used as a major dumping site in the United States of America but, because of the controversy surrounding the site, those plans have been put on hold. As a result, the University of Nevada in Las Vegas has begun a research project to test the effectiveness of a Superplasmic Field Generator© in remediation of 16 different types of nuclear wastes. The results will not be available until funding is available. From a theoretical position, there is no reason the Superplasmic Field Generator© would not be effective. Nuclear waste is considered to be one of the most challenging situations on the planet. The Academy has researched potential solutions and found alternatives. One such alternative is the “Thorium Hybrid” which uses a combination of Uranium and Thorium for nuclear reactions that give off a completely manageable, almost neutral by product that can be stored in simple glass jars or easily processed through a Superplasmic Generator. It’s environmentally safe yet produces equal amounts of energy. The financial details contained herein will vary for specific sites because each Remediation Park is site-specific. 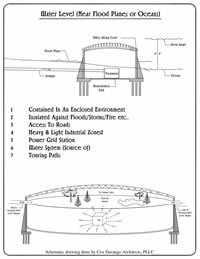 The site must be properly engineered, professionally designed, correlated with government officials, and is subject to community approval. Each site has unique conditions and different types of materials feeding into the Park, so the Retrieval Process will vary and the industrial Product Stream Network must be designed to meet these needs. Community regulations, relationships and special interests, all help define a working Remediation Park. In order to operate the Park and the Product Stream Network, thousands of new jobs will require thousands of new employees. In general, the cost of constructing a Superplasmic Field Generator© is estimated to be about twenty million (USD) dollars ($20,000,000). This compares to two hundred and fifty million dollars ($250,000,000) for the best technology currently in use (see Support Data #2). The cost of a comprehensive retrieval process can run up to hundreds of millions of dollars, this cost being managed almost entirely by the Tenants. Once operational, the Remediation Park is expected to generate sufficient funds to pay for the entire operation within one year and generate quadruple earnings for investors. The environmental benefits are even greater. The Park helps make the community self-sustainable. It employs local workers, helps maintain economic balance, and contributes to community efforts to bring the biosphere into balance. Produce an affordable self-sustainable community in balance with Nature. THE KEY CONCEPT: The Site Company will arrange for distinguished groups of Tenant Companies from around the world, with proven technologically advanced by-product recovery systems (estimate 10 to 15 Tenant Companies per park), to submit bids to the Site Company for their services. A “Tenant” Company is an experienced group of experts in retrieval of specific precious resources. Once a preliminary local/national/global study is complete and a metropolitan area has been chosen as a park location, a more specific market-study of the metropolitan area (and surrounding areas) will be performed and Tenant Companies selected. BY PROVIDING ECONOMICS OF SCALE, WHERE EACH TENANT COMPANY IS RESPONSIBLE FOR THE EXPENSES OF THEIR SPECIFIC RECOVERY PROCESS, PHOENIX REMEDIATION PARKS WILL DRAMATICALLY REDUCE THE SITE COMPANY’S INVESTMENT REQUIREMENTS. THE SITE COMPANY COORDINATES THE PERMITTING EFFORT AND MAXIMIZES THE RECOVERY OF BY-PRODUCTS, SUCH AS PAPER, PLASTICS, LACQUERS, THINNERS, SOLVENTS, HEAVY-METAL SLUDGES, STYROFOAM, ASH, OIL, AND SOLID WASTE (IN ADDITION TO MANY OTHERS). ADDITIONAL SIGNIFICANT BENEFITS WILL BE REALIZED THROUGH INTEGRATING AND NETWORKING BY-PRODUCT TECHNOLOGIES (i.e. Tenant Co. A, expert at used-oil recovery, provides feedstock for Tenant Co. B, expert at heavy-metal recovery, etc.). SIZE: Parks will vary in size (estimate 11 to 250 acres per park), depending on the needs of the metropolitan area or community being served, the material streams being processed, the number of Tenant Companies, and lot size required by each Tenant Company. More than one site may well be required for different-sized communities. MATERIALS RECOVERY: The Company will own and operate (or lease to operate to Tenant Companies) a Material Retrieval Facility (MRF) in each park. The MRF is for sorting and processing materials from the waste stream. Recyclables can be separated on site and processed or the materials can be shipped to mills. This includes paper, plastic, metals, glass, wood, organics, road materials, etc.). Material that cannot be processed by the Company or the Tenant Companies will be transferred to the Superplasmic Field Generating Plant and transformed into energy and carbon ash. MANUFACTURING: The Company will coordinate the manufacturing of environmentally friendly products as part of the Product Stream, arrange for the employment of the necessary workers, integrate the marketing, distribution and sale of products as necessary to insure integrated support of the surrounding community. GENERATOR: The Company operates the Superplasmic Field Generator in the Remediation Park. This technology provides further retrieval of precious substances at the molecular level and, for the remaining substances, disassembles their molecular structure turning them into energy and ash. The ash is collected on an electric grab-grid for industrial use. An average of forty percent (40%) of the energy produced by the Generator goes into the operation of the Park. The other sixty percent (60%) is available for community use. RESEARCH CENTER: The Site Company will establish or partner with Research Centers to provide information and technological assistance to itself and to tenant companies in order to keep the Parks on the cutting edge. The Research Center will function independently and will be financed through diverse sources, including corporate and private foundation contributions, memberships, subscription revenues and fees for services. FINANCING: The Remediation Park requires initial financing and becomes self-financing usually within one year (yield is dependent on the revenue from material streams being processed by the Park). Lease fees from tenants, as a percentage of gross income generated per tenant (The Company’s estimated gross lease income: $10 million / year /tenant/ Park) and the average number of tenants will range from 10 to 25 per Park. Profits of the research center operations (Company estimated gross Research Center income: $2 million / Park / year). ACADEMY EARNINGS: The Academy, by contract, receives twenty percent (20%) of the revenue from the Company, which, in this example, equals $24.8 million/park/year. While each park produces Academy earnings capable of financing an additional Remediation Park each year, by contract all Tenants will reinvest sufficient funds to establish FOUR ADDITIONAL REMEDIATION PARKS PER YEAR PER PARK. FROM THE INITIAL INVESTMENT IN ONE PARK, THE GROWTH OF ADDITIONAL PARKS BECOMES EXPONENTIAL. PERMITTING: The company will coordinate the permitting effort for the park and each contracted tenant company at the location, utilizing inaugurate fees collected from selected / contracted tenant companies. QUANTITY/MARKET DEMAND: The number of parks necessary per country will vary depending upon the population, level of industrialization, quality of roads and other factors. The estimated total annual income from 15,000 Remediation Parks in the United States: Eighteen trillion, six hundred million dollars ($18.6 trillion USD). These potential earnings create a financial basis for establishing sufficient Remediation Parks to wedge against continued pollution and thus slow rising temperatures. In addition, millions of tons of precious resources will be retrieved and recycled into the communities, thus insuring the continued wealth of our society, zero pollution output, and the survival of future generations (see Support Data for details). NOTE: THESE FIGURES REFLECT ONLY THE EARNINGS FROM REMEDIATION PARKS. IT DOES NOT REFLECT THE POTENTIAL EARNINGS FROM PLACEMENT OF MINI-SUPERPLASMIC FIELD GENERATORS AT THE SOURCE OF EACH INDUSTRIAL EMISSIONS COMPLEX (OUTLINE IN PROGRESS). NOR DOES IT REFLECT THE POTENTIAL EARNINGS FROM MUNICIPAL WASTE CLEANUP OR FROM SPECIFIC PRODUCT STREAMS. The outline for the Grandville, Michigan waste remediation site contains the best-estimate figures for costs and earnings. These figures are considered conservative so actual earnings may be much greater. Earnings will vary from one site to another depending upon the type and amount of materials being processed and retrieved. There are no restrictions on Remediation Parks other than those imposed by governmental law and environmental conditions in some specific territory. 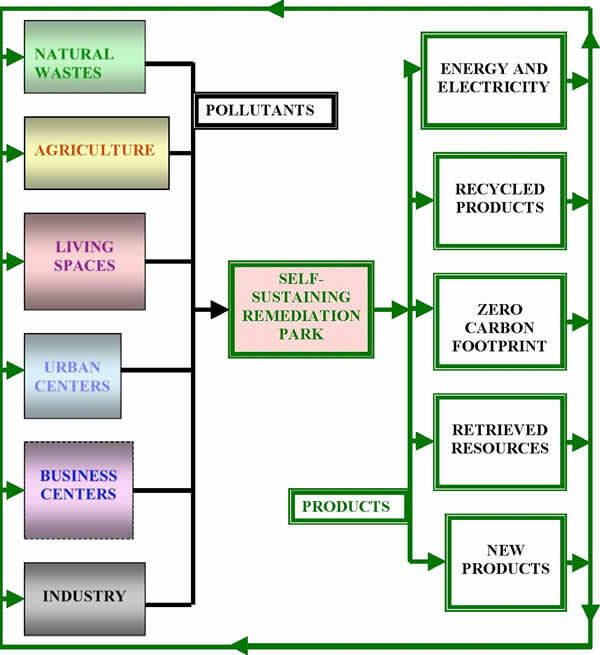 As far as we are concerned, any group may organize a Remediation Park Company in any part of the world. The PHOENIX PROJECT, sponsored by The International Academy of Natural Science, is dedicated to research, development and implementation of sustainable living for people of all ages and all ethnic and racial origin. In order to insure sustainability, we humans must take the next step in our evolution and become stewards of the planet. The Phoenix Project is vital because it creates a way to effectively transform our toxic wastes into useful products. We can clean up our environment and insure vitalized sustainability for future generations. This project creates thousands of new continual green jobs in every community, providing a new resource base for economic stability, a renewable source of energy, lessens our carbon footprint and helps balance the biosphere. So, there is a way and yes, we can do it.